Grab your craft supplies and get busy working on an awesome Valentines box that all the kids will love! 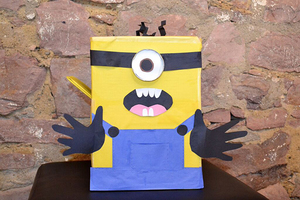 All you need is a box, construction paper and some adhesive to start imagining your creation! For both boxes I used modge podge to attach the construction paper to the cardboard box. You could use regular glue or just tape the whole thing together! This is a great Valentines Day project to work with your child and create lasting memories. Who knows, maybe they will come home from the Valentines Day party and share their treats with you! • Mail Delivery: First step was cutting a rectangle on the side of the box for cards to slide in. Do not cut the hole completely out, bend the bottom of rectangle to create an angle for cards to slide in. • Body: Start applying modge podge to box and cover the box completely in yellow paper one side at a time. To secure the paper, tape the sides where each piece of paper met on the corners. • Eyes: Create a black strap for the Minion’s eyepiece. Place the jar lid in the middle; Attach it using a hot glue gun. Put white construction paper inside the jar lid along with a black circle on top of a little bit larger brown circle for the eye. • Mouth: Make a black oval with a pink tongue and place a few teeth on top. • Overalls: Create the overalls using simple shapes: small rectangles for the straps, two black circles for buttons, and a rectangle for the bib with a smaller rectangle on top for a pocket. Finally, a long rectangle strip on the bottom to show his pants. Along the sides, make dash lines with a pen to create a hemline. • Hands & Hair: Trace your hands with black paper and place on front of box. Scrunch up some black strips for hair at attach to top of box. • Body: Start covering one side of the box at a time with modge podge. Cover the top of your box in your flesh colored paper. For the bottom of your box, create the design of your dress. To secure the paper, tape the sides where each piece of paper meets on the corners. Leave the top of the box completely open for easy drop offs of Valentine cards. • Tutu: Scrunch up tissue paper and staple it on the bottom of box to create the tutu. 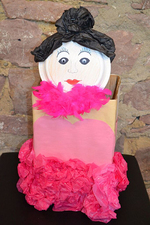 • Head: Color the back of a paper plate to create the face, then staple it to the inside of box. Staple tissue paper on the top of plate to give her some hair. Assessories: Use a scarf, hair bow, necklace and jazz up your princess ballerina lady!